France has followed other European countries and has issued environmental badges for road vehicles. An environmental badge or an environmental sticker, "Crit'Air" is a sticker which you stick on the windscreen of your car, just as you would a vignette. You can order the environmental sticker online, and when you receive it and stick it on your car, it will be clear what category your car belongs to. What Is the Environmental Badge for? The environmental badges are designed to distinguish environmentally friendly vehicles from those that pollute the air in cities and contribute to the poor living conditions there. The environmental badge therefore determines the level of air pollution caused by your vehicle, a categorisation which is indicated by the emission levels, based on a registration certificate of your vehicle (part I or part II) scanned from both sides. These documents are therefore required when ordering the environmental sticker "Crit'Air" online. Each environmental sticker is issued for a specific vehicle and it is attached to its license plate. The validity of the sticker is unlimited, so unless you want to buy a new car, you do not have to worry about replacing it. You simply order it once and you can drive all over France. The environmental badges in France are divided into six categories, i.e. there are six types of environmental sticker. You can read more about the types of the environmental sticker in the section Types of environmental badges. Ecological zones were introduced in France in 2016. France was two years behind other countries; for example, Austria introduced the ecological zones in Vienna and its wider surroundings in 2014. The ecological zones project is still very young, because gradually, more and more countries are getting involved and the existing ones, such as Germany, are extending the validity of their ecological zones to an increasing number of cities. The first city to use the environmental badge in France was Paris, which has imposed the obligation to possess the environmental badge since July 2016. It is expected that other French cities, led by e.g. Grenoble, will soon follow. You can read more about the ecological zones in Paris in the section Ecological Zones in Paris. Regarding the ecological zones, France came up with a few differences, if we look towards Germany or Austria, countries which we often use as comparisons. 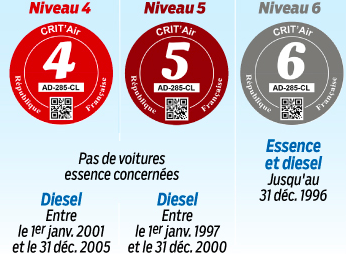 Initially, the obligation to possess an environmental badge "Crit'Air", applied only to drivers from France, i.e. cars with French license plates. Foreign vehicles have only had to have the sticker since 1. 2. 2017. You can find more information about the French ecological zones in the section Ecological Zones in France. This section will present the types of environmental stickers that you can acquire when applying for the French „Crit'Air“. We will also tell you how you can order this badge and where to put it. France has introduced a total of six types of environmental badges. At first sight, these differ mainly by colour, and thus place your car into one of six categories according to its environmental pollution level, and allow police inside the ecological zone easy control. Each badge is issued on the basis of the registration certificate of your vehicle, and tells you how noisy and environmentally friendly your car is. The badge denoting the most environmentally friendly vehicles in France receive a green colour. However, only electric vehicles can obtain this particular badge. In contrast, cars marked with the grey badge are the least environmentally friendly. Cars manufactured before 1997 and motorcycles manufactured before 2000 do not receive any badge. The colours of the other French badges are (starting from the least environmentally friendly), burgundy, orange, yellow and purple. You can see all the types of environmental badges in the picture below. At the top of each badge, there is the French word "Crit'Air", which is typical for the ecological zones in France and you can find it on the road signs indicating the beginning and end of the ecological zones. You can read more about the road signs and the ecological zones in France in the section Ecological Zones in France. How to Order French "Crit'Air"
You can easily order the environmental badge for France online, enabling a smooth entry into the centre of Paris and other cities. You only need the registration certificate of your vehicle (part I. or part II.) You will receive the French environmental sticker by post within 14 days. Shipping is free. You can order the environmental badge for France as easily as the environmental badge for Germany or Austria. The environmental badge always has an unlimited length of validity for the license plate of the vehicle for which it was issued and is valid for the whole of France. The environmental sticker for France is placed on the windscreen of your vehicle, either in the top right or the lower right corner. You can stick it, for example, next to the vignette. As soon as you put the sticker on your windscreen, you can hit the road without worries. 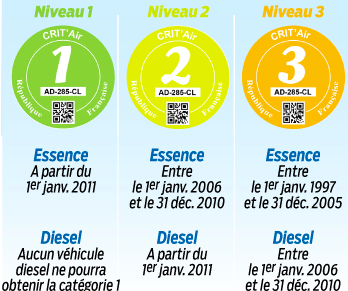 The environmental sticker enables you to enter the city centre of Paris and other ecological zones in France, according to the type of badge your vehicle has achieved. Travelling to France by vehicle? Get Crit Air for Paris, Grenoble and other cities. FREE delivery within 14 days.